I get a lot of questions around the Holiday Season from folks and fans who want to smoke a ham centerpiece for their dinner party. 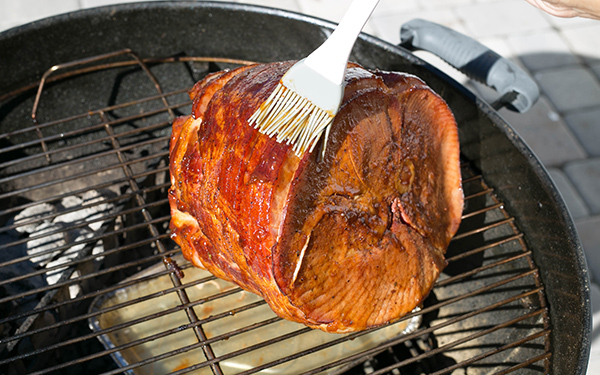 How do you smoke a ham? Well, it’s easier than you think because many excellent tasting hams are already fully cooked and smoked. 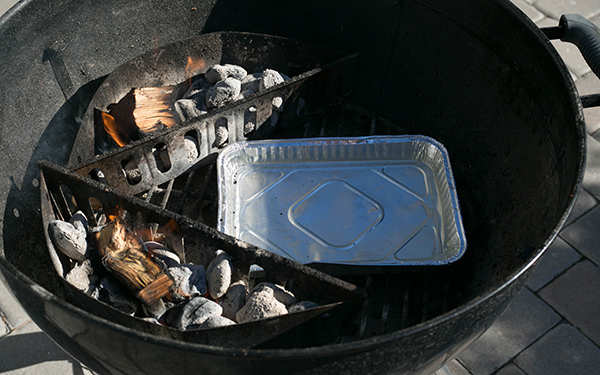 All you need is to add your personal touch with a little more smoke TLC in your pit and massage it with a tasty glaze. For ham glazes, I love the combination of sweet and fruity. One of my favorite crowd pleasing combinations is a ginger-peach glaze that’s sure to bring a smile to your guests. My recipe is inspired by a fruit that traces its origins to China where it was a highly regarded fruit of kings and emperors going back 2000 BC. The peach travelled to Persia (now Iran) before Alexander the Great introduced it into Europe after he conquered Persia around 100 AD. Since peaches are from China, I’ve paired it with another common Chinese ingredient which is ginger. 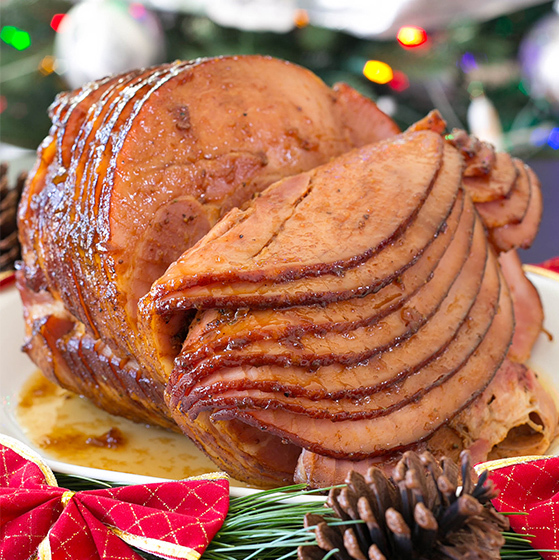 This flavor combination gives the already-cooked ham an exotic and subtle flavor. Unwrap ham and remove any packaging and netting. 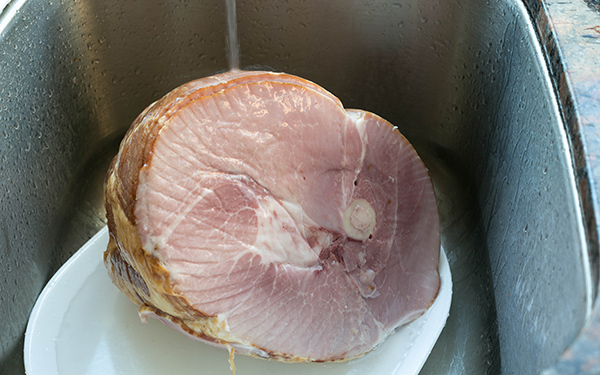 Rinse ham for 15 seconds under the faucet to remove excess salt. Pat dry with paper towels. Sprinkle a light coating of SYD rub to kick up the flavor. Heat up kettle with a hot and cool zone. Put a disposable half foil pan under grates on the cool half of the kettle. Add a half inch of water to keep your kettle moist during the cook. Preheat to 350F with lid closed. Place ham on cool side of kettle and smoke until internal is about 140F. Add a tennis-sized chunk of wood every 45 minutes (I used two chunks of hickory in the entire cook). 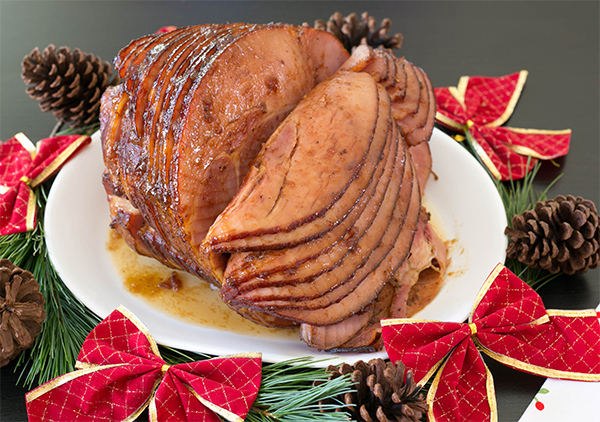 You may need to rotate the ham every 45 minutes so it cooks evenly. The cook will take 2-3 hours depending on the size and how cold your ham was when you started. 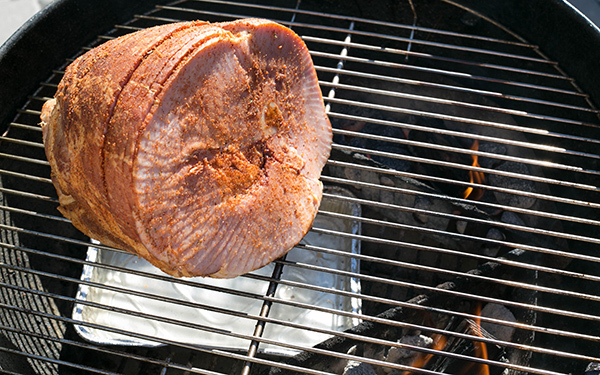 The ham will drip on the foil pan under the grates making cleanup easier. Once you have reached 140F, you can move ham over to the hot zone and get some nice char and set the glaze. Tent with foil and rest 15 minutes before serving. Serve the glaze on the side. I made this for extended family over the Holidays and it was fantastic. 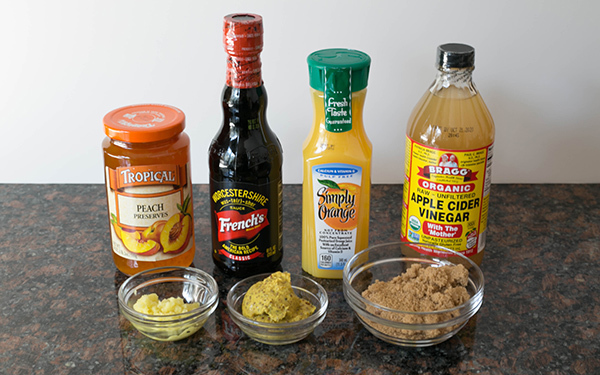 For smoke…I used primarily Apple wood with just one small block of mesquite for tang in my wsm. I followed Harry’s recipe exactly as stated. I was told by many that it was the best Ham they ever had. That is quite a compliment as I have picky eaters and also lots of kids in my family. I am glad I took a leap to try this and will definately make it again. Thanks Harry for this fantastic recipe. I have tried many this year since I was given my first wsm for Father’s Day and appreciate your help along the way. Time to fire up the pits again for Easter Sunday coming up! Keep spreading barbecue love Bill. Harry, i wanted to share a great experienced. Today my family made dinner for 2 dozen homeless men living at a local shelter. I made 2 of your smoked peach ham, and my extended family made turkeys and chickens. We also dined with the men and had mutually rewarding conversation. A third are long term homeless, a third with horrible medical issues or accidents that made them homeless, and a third made bad decisions previoisly and recently released from jail. Btw The ham was so well received, it was given 3 ovations. We are going to schedule another dinner and i will do ribs and or brisket. Several men said they never had brisket. I am going to change that. I need to change that. Thanks for the bbq guidance and Happy Thankgiving. What an amazing story! The world needs more kindness and folks like you! God bless you and the folks who shared your goodwill. Sauce was great, but this was my first spiral ham and I have to say I much prefer one that’s not pre sliced . It was quite dry rather bland, but maybe I just got a bad one. Love your site and recepies and refer to it all the time.